I haven’t been too active on this blog lately (the dangers of a day job), but I wanted to take a second to tell you about the sequel to Liza’s book, Surviving Outbound, which I blogged about last month. One of the most popular posts on my blog is entitled, “Happy Endings: The Other Side.” In the post, I discuss the idea that there is nothing wrong with the main character dying at the end of the story, and in fact, it may actually help us (especially children) learn to deal with and accept our eventual fates. In Liza’s books, there are ‘pre-ordained’ deaths, which are a very interesting concept, and one I thought would be of interest to readers of this blog. I got the opportunity to ask her about them, and her answer is below. Feel free to comment and leave your opinion on death in books, pre-ordained or otherwise! One disturbing point of my books is there are quite a few Pre-ordained deaths. Both Tamara and Blue are fully aware that their deaths were pre-ordained. On the positive side, neither actually ‘dies’. The simply transform into a different entity, rather like a powerful spirit. I wouldn’t mind a pre-ordained death, especially if I got to help a great cause in doing so. Then, hopefully, I could get everything in order before my death. Maybe even clean the house, but that would be the last on my priorities. If I knew the exact time of my death, I could give all my stuff away and not worry about the future. But alas, we don’t get an exact time of death. Even if you have cancer, exactly when you will go isn’t known until a short while before. Six months can be three months or nine. I would love to know, down to the very second, so I could give away all my worldly goods in person. It would please me a great deal doing good deeds ‘til the end. My spirit Tamara, was told by Pane as she was in the agonizing pains of death, that her demise was pre-ordained and necessary to protect her soul-bond and her husband when they go Outbound. And while she didn’t enjoy her excruciating death by poison, at least she didn’t have to blame herself for being stupid enough to stick her hand into a bag which was supposed to have apples in it only to be bitten by the most deadliest snake in the world, the inland Taipan snake. That it rested in her bag of apples is most odd because it naturally lives in Australia, which was half-way around the world. 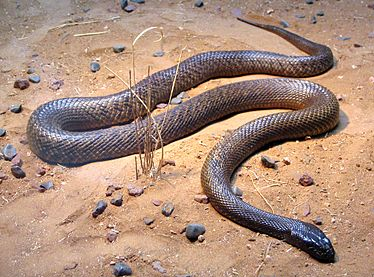 The Inland Taipan is normally non-aggressive to humans. It would prefer to get away from them. But stuck in a bag with a giant hand reaching in, it had no choice but to defend itself. And it did, killing Tamara in short order. As she died, Pane told her the good news about her transformation so she could keep Saran and Dmitri safe. The other pre-ordained death is Blue’s, yet Pane has no idea who told him about his forthcoming death. Pane had no idea of the complexities required to save the Path of Light until a short time before the event when he dreamed a very complex solution to the problem at hand. Do you think it possible that the dream Pane had in his sleep was like the advice he gives his sentients while they sleep? Did an even bigger God, possibly the First God, dream speak to him? Leading a colony of frightened people on a new world is rarely easy. The human colonists of Terranue have as their leader, Tamsarandem, the only Soul-bond of Three that has ever existed. Unfortunately, some perceive the innate kindness in the shaman’s choice of leaders as a weakness, thus, challenges begin. From the moment they arrive on the planet, self-survival instincts take hold among the colonists, putting the survival of the colony at risk. To survive, they must act for the good of the colony rather themselves, even when their natural instincts tell them to do the opposite. 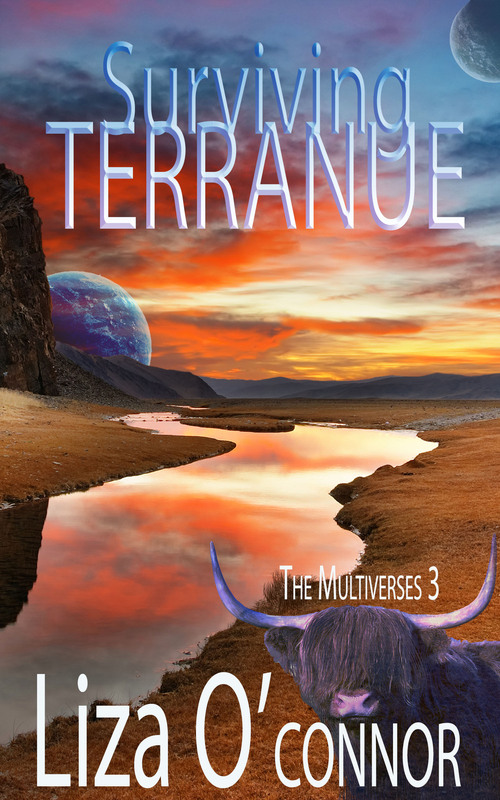 First, they must befriend the dominant intelligent life form on the planet, long-haired blue cattle, only slightly smaller than the blue bull Tamsarandem brought with them. Second, they must find a way to survive three of the planet’s five seasons. Otherwise, they’ll be baked, frozen, and pummeled to death. Third, they must protect themselves from the giant bears, saber tooth lions, and T. rexes that roam their planet. But worst of all, deep within the planet, a seed of evil grows, waiting to devour every living creature on the surface. Every day in their new paradise is a challenge to survive. Despite all the advantages the Gods have provided, success is neither easy nor certain, and people are rarely as good as they need to be. Pane was confounded. For the second time, the old bull, Solomon, spoke of prophecies. First, he declared Blue’s arrival to be one and now he claimed the black death that would annihilate everything on the planet had been foretold as well. Where had these prophecies come from? Certainly not from him. “Marybell, can you determine when and by whom these prophecies were created? “It won’t cause your personality to change will it?” Pane asked. “How is that possible?” Pane asked. “Do you have any guess to how a planet from a much older multiverse made its way into our universe? The possibility that the First God wanted them to succeed caused Pane’s entire body to shiver in awe. Liza is a multiple genre author of 16 novels. A Late Victorian Series, The Adventures of Xavier & Vic, plus a spinoff, A Right to Love, is an ongoing series. A Long Road to Love is a humorous Contemporary Disaster Romance series of five books. She has two single books. One is a humorous, bad boys contemporary novel with ghosts, called Ghost Lover, the other is Untamed & Unabashed, a spinoff from Jane Austen’s Pride and Prejudice. I suppose if I have to die, I would want to do it to save others. Now if I had the option of sticking around as a ghost to help others…then it would even be better. 🙂 I love this series and if you haven’t read it…one-click it today!! Tamara and Blue both thank you. And both are pleased they can do their part in the bigger scheme of matters.